Hailed by New Zealand’s National Radio as the pioneer of a new sound, Jordans music has been variously described as “industrial folk”, “folk noir” and “Antipodean Steampunk” yet defies any cut and dried description. Imagine a 19th Century Nine Inch Nails banging on old iron and steam powered machines, combined with the Dead Can Dance’s electronic folk soundscapes and Sinead Oconnor’s vocals in the background. Jordan combines pioneer-era industrial found sound, with folk instrumentation and etherial vocal melodies. She usually writes “concept” albums with stories, old and new, told song by song. This means it makes sense to hear them whole. For that reason, her first 4 CDs are available via the discography listing on her Webpage for private listening purposes. Her Blog “the secret life of machines” is also read-worthy. I’ve listened to her latest release, and I would have to agree with professional reviewers, her new release “How the Dead Live” is original, dark, and very, very powerful. One reviews states that this release is ” A soundtrack to the cinema of unease”. What more can I add? Have a listen. 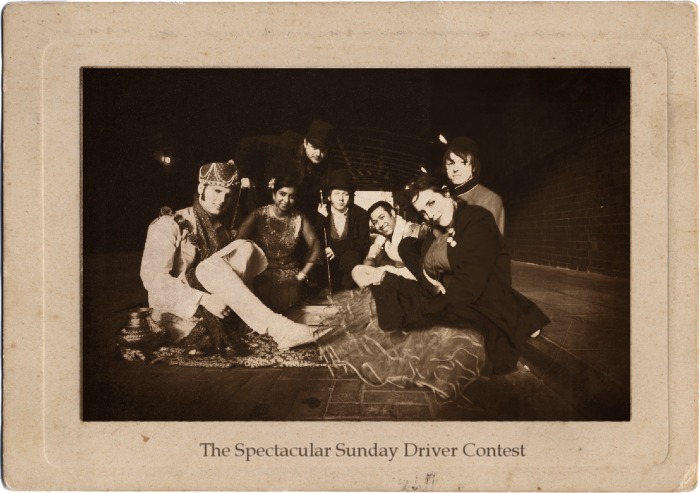 The wonderful Steampunk band Sunday Driver is having a contest . So enter the contest, help the band and win some great things. Our friends, dieselpunks.org, tipped us off to the Deadly Nightshade Botanical Society‘s CD release party for Accoutrements and Oddities. If you’re in the Seattle, WA area this Saturday — check ‘em out! Some more Steampunk Music to consider. Today’s offering is the RPM Orchestra. It has been written that there is the whole world to play with when you wish to do steampunk. This band “Sunday Driver” is a WONDERFUL example of that as well as just some of the best new music I have heard in a long time. Then have a gander at the latest site to feature Steampunk (and other ) genre music. The PhonoVault is a new sales site, devoted to Avante-Garde, Dark Roots, Steampunk, Dieselpunk, Balkan/Gypsy music, Hokum Blues, Victoriana, Chamber Pop, Cabaret, Gothic Country, and Neo-Vaudeville. PhonoVault currently has online stores catering to both the US and UK, carrying an eclectic mix of music. Stop by and have a look. Why not use this portentous piece of whimsey as your message alert…? I am told (by a young person) that it is an mp3 file…. What exactly was wrong with the wax cylinder….? This Sunday (25th of May) there is going to be a bit of a ‘perfect storm’ of Steampunk in LA – Abney Park (one of the best known Steampunk bands in existance) will be playing at The Edison bar (possibly the most beautiful Steampunk locale in the world) and are rumoured be accompanied by two of the brightest and best loved Steampunk creating celebrities around. (I’m not sure I’m allowed to mention who the gents are, but I know they’ll probably tell me off for calling them celebrities! Sorry, Sirs.) There’ll also be high-flying aerialists and the highly regarded DJ Imagika. Abney Park, Live at The Edison, then – it sounds fantastic. 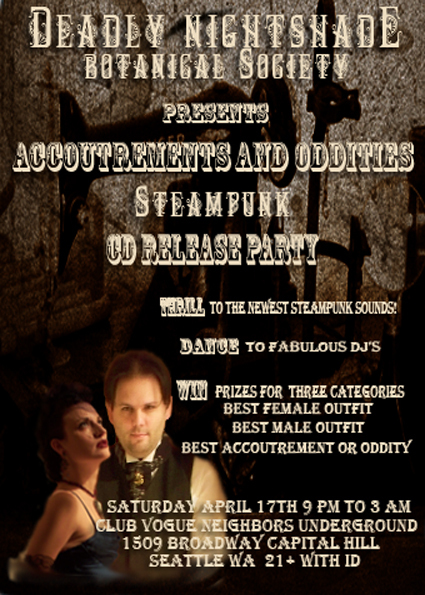 I’m told there are still tickets to be had, and that it’ll be strictly age 21+ (that’s Earth years), and that this will hopefully be just one of many future Steampunk events held at The Edison in future. I know in previous posts we’ve wondered if the clientele at The Edison could be as wonderful to look at as the event, but I can very quickly cast that doubt aside knowing the lineup as I now do! To those who go – I am quite envious, please report back and do take photies! Odd as it may seem, this video is surprisingly catchy – it shows the irrepressible Mr Elemental waxing lyrical about his preferred beverage, tea. Clad in his pith helmet and more than a little wide-eyed from rather a lot of caffine, and accompanied by a gyrating lady and his phonograph-spinning butler, he comes across as a little strange, but well – he’s just very keen on tea. Around the world in 80 brews – herbal? No thanks. Thanks instead go to Mr Alexander Edmund Clough for his excellent taste in videos.